به­تنهایی، پاسخگوی نیازهای مهندسان شیمی و صنعت نیست، و علم زیست‌شناسی ­باید در کنار علم شیمی به­عنوان یکی از ارکان اصلی ساختار آموزش مهندسی شیمی مدرن در نظر گرفته شود. برخلاف کشورهای پیشرفته، که این مهم را در ساختار نظام آموزشی مهندسی شیمی اعمال می­کنند و حتی عنوان این رشته را به «مهندسی شیمی و زیست­شناسی» و نظایر آن تغییر داده­اند، در ایران به­جز تعداد محدودی، که در مقاطع تحصیلات تکمیلی در گرایش خاصی از حوزة مذکور تحصیل کرده­اند، مهندسان شیمی از دانش زیست‌شناسی برای مواجهه با چالشهای جدید بی­بهره­اند. این پژوهش با هدف آگاهی­رسانی دربارة ضرورت گذار از «مهندسی شیمی» به «مهندسی شیمی و زیست­شناسی»، که متخصصان آن مهندسان شیمی آشنا با زیست­شناسی هستند، انجام شده و در این راستا به بررسیِ کلیات برنامة آموزشی رشتة «مهندسی شیمی و زیست­شناسی» و مباحث روز آن پرداخته و پیشنهاد می­کند که با به­روزرسانی برنامه درسی مهندسی شیمی، و یا تأسیس چنین رشته­هایی، زمینة فعالیت در حوزه­های جدید مهندسی و همچنین مواجهه هرچه مؤثرتر با چالشهای روز فراهم شود. Development of biology has created new fields, such as Biotechnology and Biomedical Engineering. The advances in the mentioned fields, which are all interdisciplinary, depend on the activities of chemical engineers who are familiar with science biology. The necessity of chemical engineer`s activities in relevant areas with biology and inevitable use of biological means in confrontation of chemical engineering with environmental, economical and industrial challenges, proved that in the current century the sole familiarity with chemistry is not responsive to the needs of chemical engineering. However, the science of biology must be also considered as an important element of the modern chemical engineering along with the chemistry. In contrast to the developed countries, which have applied this important item in their educational systems, and even changed the title of this field to "chemical and biological engineering", Iranian chemical engineering has not profited biology in confrontation with new challenges; except a few who have educated in this area at graduate levels. This research is conducted with the aim of awareness regarding the necessity of transition from "chemical engineering" to "chemical and biological engineering" where the graduates are chemical engineers being familiar with biology. In this regard, the general educational program of "chemical and biological engineering" field has been reviewed and it has been recommended to update the curriculum of chemical engineering, or to establish such fields, in order to provide the requirements for the new engineering areas and also more efficient confrontation with new challenges. اشرفی‌زاده، سیدنظام­الدین؛ نیک‌بخش، سارا و علوی، زهره (1385). زیست­فناوری و مهندسی شیمی. فصلنامه آموزش مهندسی ایران، 8 (29)، 1–15. 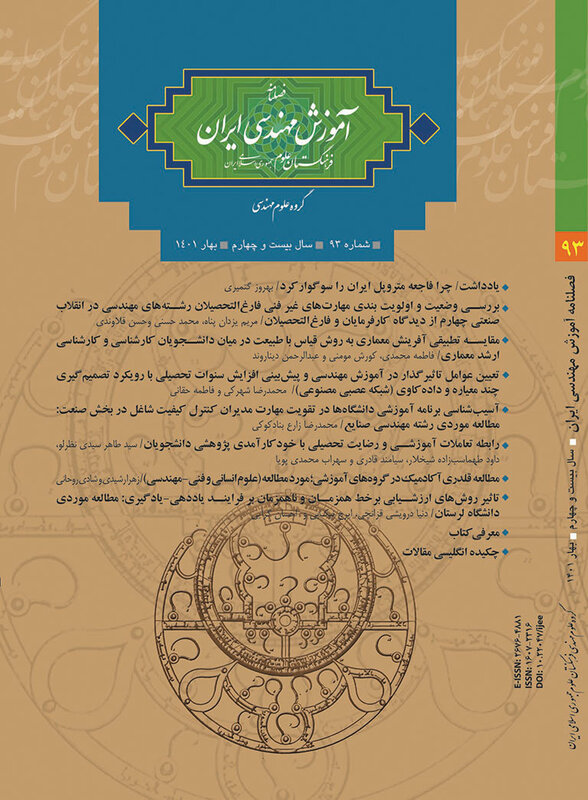 گنجی‌زاده، اردلان و اشرفی‌زاده، سیدنظام­الدین (1396). ریزسیالش، حوزه­ای نوظهور در مهندسی شیمی. فصلنامه آموزش مهندسی ایران، 19(73)، 139–168. مطهر، صادق و عالم‌رجبی، علی اکبر (1395). آموزش انرژی­های تجدیدپذیر در ایران. فصلنامه آموزش مهندسی ایران، 18 (69)، 77–90. Ankireddy, S. R. and Kim, J. (2017). Synthesis and characterization of quantum dot-loaded fibers by an electrospinning process. Journal of Nanoscience and Nanotechnology, 17, 2720–2723. Arrell, S. T. F. and Esketh, R. O. P. H. (2002). An introduction to drug delivery for chemical engineers. Chemical Engineering Education, 36(3), 198–203. ASHP. (1993). ASHP statement on the pharmacist’s role with respect to drug delivery systems and administration devices. American Journal of Health-Systems Pharmacy, 50, 1724–1725. Azlina, W. W.; Amran, M. M.; Radiah, A. D. and Salmiaton, A. (2013). Sustainable development in chemical and biological engineering education. Procedia - Social and Behavioral Sciences, 102, 490–498. Bhambhami, A. and Medi, B. M. (2010). Selection of containers/closures for use in lyophilization applications: Possibilities and limitations. American Pharmaceutical Review, 13(4), 86-91. Bhavishya, M. (2016). How to develop robust solid oral dosage forms: Academic Press. CBD.int. (2017). Text of CBD. Retrieved from https://www.cbd.int/convention/ articles/ default.shtml?a=cbd-02. Cronin, K.; Ring, D. and Montañez, J. C. (2017). Influence of granulation process parameters on food tablet properties formulated using natural powders (Opuntia ficus and Chlorella spp. ), Powder Technology, 317, 281–286. Dutta, R. (2008). Fundamentals of biochemical engineering (1st ed.). Berlin: Springer-Verlag Berlin Heidelberg. Favre, E.; Roizard, C. and Schaer, E. (2008). Trends in chemical engineering education: Process, product and sustainable chemical engineering challenges. Education in Chemical Engineering, 3, 22–27. Garnier, G. (2014). Grand challenges in chemical engineering. Frontiers in Chemistry, 2, 1–3. http://doi.org/10.3389/fchem.2014.00017. Gavrilescu, M. and Chisti, Y. (2005). Biotechnology — a sustainable alternative for chemical industry. Biotechnology Advances, 23, 471–499. Hatti-Kaul, R.; To, U. and Gustafsson, L. (2007). Industrial biotechnology for the production of bio-based chemicals a cradle-to-grave perspective. Trends in Biotechnology, 25(3), 120–124. Heise, G. (2014). Kyoto prize for founder of tissue engineering. Retrieved from http:// www.dw.com/en/kyoto-prize-for-founder-of-tissue-engineering/a-18051946. Hong, S.; Jang, E.; Dysart, A. D.; Pol, V. G. and Lee, K. B. (2016). CO2 capture in the sustainable wheat-derived activated microporous carbon compartments. Scientific Reports, 6, 34590. Järvinen, M. A.; Paaso, J.; Paavola, M.; Leiviskä, K. and Juuti, M. (2013). Continuous direct tablet compression: Effects of impeller rotation rate, total feed rate and drug content on the tablet properties and drug release. Drug Development and Industrial Pharmacy, 39, 1802–1808. Jiang, Y.; Zou, S. and Cao, X. (2016). Rapid and ultra-sensitive detection of foodborne pathogens by using miniaturized microfluidic devices: A review. Analytical Methods, 8(37), 6668–6681. Jong, E. De and Jungmeier, G. (2015). Biorefinery concepts in comparison to petrochemical refineries. Industrial Biorefineries and White Biotechnology, 3–33. Joslin, J. M.; Hawker, M. J.; Reynolds, M. M. and Fisher, E. R. (2014). Creation of hydrophilic nitric oxide releasing polymers via plasma surface modification. ACS Applied Materials and Interfaces, 6(15), 12307–12320. Keasling, J. D. (2008). Synthetic biology for synthetic chemistry. ACS Chemical Biology, 3(1), 64–76. Kern, J. D.; Hise, A. M.; Characklis, G. W.; Gerlach, R. and Gardner, R. D. (2016). Using life cycle assessment and techno-economic analysis in a real options. Bioresource Technology, 225, 418–428. Kulkarni, R. (2016). Metabolic engineering: Biological art of producing useful chemicals. Journal of Science Education, 21(3), 233–237. Langer, R. and Vacanti, J. P. (1993). Tissue engineering. Science, 260 (5110), 920–926. Le, C. D. (2012). Gasification of biomass: An investigation of key challenges to advanced acceptance of the technology. PhD Thesis, University of Bath. Lee, S. and Shah, Y. T. (2012). Introduction to biofuels and bioenergy: CRC Press. Liu, S. (2016). Bioprocess engineering: Kinetics, sustainability, and reactor design: Elsevier. Lutzke, A.; Neufeld, B. H.; Neufeld, M. J. and Reynolds, M. M. (2016). Nitric oxide release from a biodegradable cysteine-based polyphosphazene. Journal of Materials Chemistry B, 4, 1987–1998. Lutzke, A.; Tapia, J. B.; Neufeld, M. J. and Reynolds, M. M. (2017). Sustained nitric oxide release from a tertiary S-nitrosothiol-based polyphosphazene coating. ASC Applied Materials and Interfaces, 9(4), 2104–2113. Mallapragada, S. K. and Uz, M. (2017). Smart materials for nerve regeneration and neural tissue engineering. Smart Materials for Tissue Engineering, 382–408. Maniruzzaman, A. M.; Ross, S. A.; Nair, A.; Snowden, M. J. and Douroumis, D. (2017). A quality by design (QbD) twin—screw extrusion wet granulation approach for processing water insoluble drugs. International Journal of Pharmaceutics, 526(1), 496–505. Mateo-ortíz, D.; Mota-aguilar, D. A.; Florián-algarín, M. A.; Avilés-barreto, S. L.; Méndez, R.; Velázquez, C. and Cardona-martínez, N. (2012). Motivating K-12 students to study pharmaceutical engineering using guided hands-on visits. Education for Chemical Engineers, 7(4), e219–e229. Mckinstry, C.; Cussen, E. J.; Fletcher, A. J.; Siddharth, V. and Sefcik, J. (2017). Scalable continuous production of high quality HKUST-1 via conventional and microwave heating. Chemical Engineering Journal, 285, 718–725. Michan, I. M. L. (2011). Biomedical engineering – From theory to application: Tech. Mohamed, B. A.; Ellis, N.; Soo, C. and Bi, X. (2017). The role of tailored biochar in increasing plant growth, and reducing bioavailability, phytotoxicity, and uptake of heavy metals in contaminated soil. Environmental Pollution, 230, 329–338. Navin, C. V.; Krishna, K. S. S., C. T. and Kumar, C. S. (2016). Space and time-resolved probing of heterogeneous catalysis reactions using lab-on-a-chip. Nanoscale, 8(10), 5546–5551. Osorio, J. G.; Stuessy, G.; Kemeny, G. J. and Muzzio, F. J. (2016). Micro-mixing dynamics of active pharmaceutical ingredients in bin-blending. Chemical Engineering and Processing: Process Intensification, 102, 141–155. Pitts, K. L. and Fenech, M. (2013). Micro-particle image velocimetry for velocity profile measurements of micro blood flows. Journal of Visualized Experiments, 74, 50314. Place, L. W.; Sekyi, M., Taussig, J. and Kipper, M. J. (2016). Two-phase electrospinning to incorporate polyelectrolyte complexes and growth factors into electrospun chitosan nanofibers. Macromolecular Bioscience, 16(3), 371–380. Plunkett, N. and Brien, F. J. O. (2011). Bioreactors in tissue engineering. Technology and Health Care, 19, 55–69. Pramanik, H. and Rathoure, A. K. (2017). Electrooxidation study of NaBH4 in a membraneless microfluidic fuel cell with air breathing cathode for portable power application. International Journal of Hydrogen Energy, 42, 5340–5350. Qin, L.; Fan, Z.; Xu, L.; Zhang, G.; Wang, G.; Wu, D.; … and Meng, Q. (2015). Submerged membrane bioreactor with pendulum type oscillation (PTO) for oily wastewater treatment: Membrane permeability and fouling control. Bioresource Technology, 183, 33–41. Ramezani, R.; Mazinani, S.; Felice, R. Di; Darvishmanesh, S. and Bruggen, B. V. D. (2017). Selection of blended absorbents for CO2 capture from flue gas_ CO2 solubility, corrosion and absorption rate. International Journal of Greenhouse Gas Control, 62, 61–68. Rathoure, A. K. and Pramanik, H. (2016). Electrooxidation study of methanol using H2O2 and air as mixed oxidant at cathode in air breathing microfluidic fuel cell. International Journal of Hydrogen Energy, 41, 15287–15294. Saliceti-piazza, L.; Rico, P. and Buxeda, R. (2004). Incorporation of biology knowledge and skills into a chemical engineering laboratory course to address a biotechnology professional profile. International Conference on Engineering Education and Research, 417–421. Sawhney, S. G. (2007). Fundamentals of biomedical engineering: New Age International. Shao, Z.; Ang, E. L. and Zhao, H. (2006). Biomolecular engineering. Retrieved from pdfs. semanticscholar.org. Sharma, S.; Zapatero-Rodriguez, J.; Estrela, P. and Kennedy, R. O. (2015). Point-of-care diagnostics in low resource settings: Present status and future role of microfluidics. Biosensors, 5, 577–601. Shuler, M. L. and Kargi, F. (2002). Bioprocess engineering basic concepts (2nd ed. ): Prentice Hall PTR. Stephanopoulos, G. (2003). Chemical and biological engineering. Chemical Engineering Science, 58, 3291–3293. Su, Y.; Zhang, X.; Wei, X. and Kong, J. (2014). Evaluation of simultaneous biodegradation of methane and toluene in landfill covers. Journal of Hazardous Materials, 274, 367–375. Subrahmanyam, C. V. S.; Setty, J. T.; Suresh, S. and Kusum Devi, V. (2002). Pharmaceutical engineering: Principles and practices: Dehli Vallabh Prakashan. Vacanti, C. A. (2006). The history of tissue engineering. Journal of Cellular and Molecular Medicine, 10(3), 569–576. Varma, A. (2003). Future directions in chemical engineering education: A new path to glory. Lecture Series in Chemical Engineering, 37(4), 284–284. Villarrubia, C. W. N.; Soavi, F.; Santoro, C.; Arbizzani, C.; Serov, A.; Rojas-carbonell, S. and Gupta, G. (2016). Self-feeding paper based biofuel cell/self-powered hybrid μ-supercapacitor integrated system. Biosensors and Bioelectronic, 86, 459–465. Yoon, J. and Kim, B. (2012). Lab-on-a-chip pathogen sensors for food safety. Sensors, 12, 10713–10741.